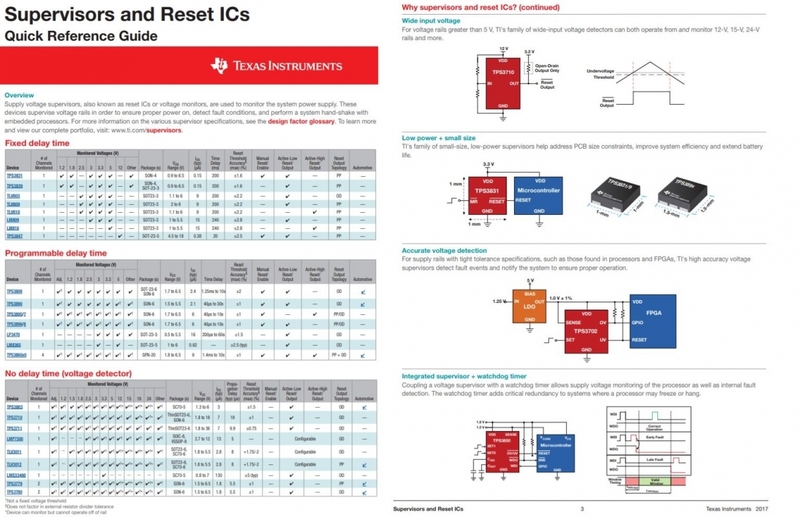 Interested in Voltage Supervisors, Voltage Monitors, Voltage Detectors, and Reset ICs? Learn about the basics with this Voltage Supervisors 101 training series. Many people confuse voltage supervisors with voltage monitors, voltage detectors, and reset ICs; however, these devices are all the same. This training series will cover a wide range of topics covering the introduction to supervisors to understanding the key specifications and features that a supervisor can bring to your subsystem. Pick any supervisor topic from this training series that you're interested in and learn today. Remember that whenever there is a voltage rail, a supervisor should be utilized to ensure that the system is able to execute safely and avoid brownout conditions. In this video, learn about what a voltage supervisor is and discover the common use cases of voltage supervisors. Voltage supervisors are commonly paired with DC/DC converters, LDOs, and Processors/MCU’s in order to monitor the voltage rail. We will also highlight how a supervisor works in order to protect your subsystem from brownout. Remember, a voltage supervisor is the same as a voltage detector, voltage monitors, and reset ICs. 03:17 This video will highlight the voltage supervisor and explain what a voltage supervisor is, how it works, and go over use cases. In this video, we will demonstrate how a voltage supervisor works. Specifically, we will analyze how an under-voltage supervisor with an open-drain and active-low output topology operates. 02:22 This video will dive into the insides of a supervisor. We will cover input voltage, time delay, and output. In this video, we will explain and define the important input specifications that pertain to voltage supervisors. Specifically, this video will cover voltage threshold, hysteresis, power-on reset (POR), and manual reset. 08:47 Input specifications to voltage supervisors such as voltage threshold, hysteresis, power-on reset (POR), and manual reset will be covered. Learn about the different output configurations voltage supervisors offer along with its timing features. Specifically, this video will go into the pros and cons to push-pull and open-drain topologies and explain what active-high and active-low mean. For timing features, learn about propagation delay and reset time delay and how these can be used in your applications. This video will cover the watchdog and window detector feature offered with voltage supervisors. Specifically, we will highlight the standard and window watchdog timer to show its importance in processors and microprocessors. Additionally, we will highlight important features on the datasheet that affect the performance of the watchdog timer. We will also cover the window detector, which can detect both over and undervoltage conditions (OV/UV). 04:41 Learn about two built-in features that can come with voltage supervisors. These features include the watchdog timer and window detector.